Copyright �2001 PopEntertainment.com. All rights reserved. Bridging hard rock with the macabre, Blue �yster Cult has forged out a remarkable four-decade career. While not experiencing the heady success of their Seventies heyday, BOC remains a fixture on classic rock radio and in a concert venue near you. 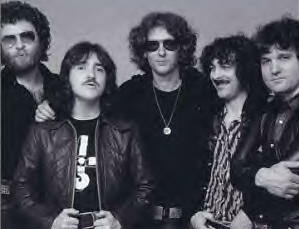 We caught up with the group's lead guitarist and chief songwriter, Buck Dharma for a career-spanning conversation. BOC has been around for an amazing four decades. I think the endurance is a factor. It is stubbornness. (laughs) Playing guitar and singing is what I do so I keep doing it and I think the rest of the band feels the same way. As far as the length of our career I'm kind of surprised that rock as we know it and as we do it has endured. I wouldn't have thought that going in. Do you believe that Classic Rock will always exist in some form? I have no idea. I'm just surprised at the way it's gone, as far as the support from the public that we've got. When I was a kid my dad's music hasn't endured like that. But they probably didn't use Marshalls back then? (Laughs) Maybe that's what it takes. In speaking about BOC's new CD, Curse Of The Hidden Mirror, you mention wanting to craft a 'Classic Rock' sounding album. It's basically going with your strengths. For us to reinvent ourselves, it's not really necessary or desirable. Certainly I think our best work is when we stay true to what our soul is, musically and stylistic wise. I like to think of it as closing your eyes and creating or closing your eyes and playing, that's what came out when we did that metaphorically. It was joyful. Rather than worrying about 'what am I gonna do in 2001, how's it going to fit in with the popular culture of the day?' I'm just not worrying about that at all at this point. Can you characterize the elements that make up classic BOC song? Guitars, rhythm, choruses. Real super-competent playing, a clever lyrical concept, some kind of content there that is not devoid of meaning. The opening cut on the new CD, "Dance On Stilts" has that distinct classic rock feel, bringing to mind Cream's "Tales Of Brave Ulysses." The ending of the song takes you to another place. It was a little nervy putting a six and a half minute song as the first cut on the CD but it did work. When I wrote that song it was almost like two songs. I've always liked the segue thing where one song turns into another. Lyrically, the first piece is celebrating a supportive relationship in the face of good times and bad times. I just really dug it from the beginning. The band did a really great job on it. We've been playing that live and audiences who have never heard it before really dig it. BOC always stood out from your hard rock contemporaries as your lyrics resonated with a deeper, more profound and intelligent core. 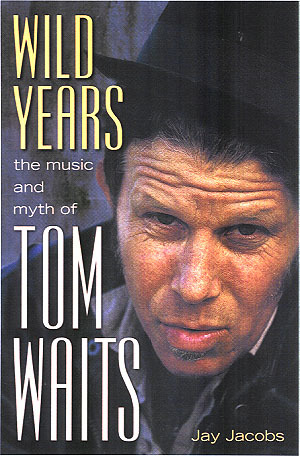 I was personally schooled by our early lyricists, Sandy Pearlman and Richard Meltzer. When I was a kid I barely listened to words at all. I was very much into the music and very much interested in musicianship and less about lyrical content as it was typically some teenage love song. But I got to appreciate lyrical content in our early days with the original band. That's carried through as an aesthetic with Blue �yster Cult to where we couldn't write trivial songs. (laughs) It wouldn't suit us at all. BOC's lyrics dealt with the darker side of life, a more sinister, almost supernatural overtones to your lyrics. I think that's primarily what Blue �yster Cult is. Through Sandy's words, we considered ourselves a literary band. That and cinema is what we shoot for. We try to really create a picture so we are always mindful of that, of creating an experience for the listener. Select a few lesser known BOC songs that you would urge people to rediscover. It's interesting that you mention Patti Smith. She was romantically involved with BOC's Allen Lanier in the 70's. How did your collaboration come about? Patti and Allen were together for about six, seven years. When we first met Patti she just about to make the transition from poet to performing artist. There was actually some talk of having Blue �yster Cult be her band. Now obviously that didn't happen and she began to work with Lenny Kaye and the band that she has developed out of that. We never actually wrote songs together as an intentional project, what we would do is Patti would give us a lyric or we would go in her book of writings and take a section of something and create songs from it. When I wrote "Shooting Shark" I hadn't seen Patti in seven, eight years, after she left Allen and married Fred "Sonic" Smith. I came across the typewritten sheet ands went, "Wow, this has been here all along." So I created the music from the words. There wasn't actually much direct interaction. Speak about your guitar playing, your style is very melodic and structured. As a listener I really like melody. One thing I notice is that the older I get the more melodic I like to be as a listener and as a player. The energy and the angst of heavy music is appealing to youth but it seems like the older I get the more melody I want to hear. If that makes me a fuddy duddy, so be it. Melodically I have to have that to satisfy myself and my playing in general. I always want to please myself and entertain myself. Okay, you can play fast or play a lot of notes, but for me everything you do has got to have a reason. "(Don't Fear) The Reaper" shines with a beautiful, haunting melody. That was written on a six-string. That was the first tune that I had created once I got a Teach four-track recorder. When affordable multi-track recorders became available in musician's hands, you used to have to go into a studio to do that, it really changed a lot of music just in the way that digital has changed music today. It was the first time that individuals could arrange entire songs. When Blue �yster Cult got four track recorders it really changed the way we wrote. That was the first example of that. The guitar lick was created and the first two lines of lyrics sprung a hole. The song took a bout six weeks to complete. It was a very creative period for the entire band because there was this new modality of creation. I think the tunes that came out of that era are a lot more individually stamped in the way you can tell a Dharma tune from an Albert Bouchard tune or a Joe Bouchard tune or an Eric Bloom tune. Are you surprised by the song's continued popularity? I'm delighted. Am I surprised? Yeah, I suppose. But I guess I'm surprised by the whole ride and longevity of our music. The song carries an interesting juxtaposition of an 'up' melody earmarked by a haunting, supernatural lyric. That's the kind of entertainment that I like. I like stories with twists. I like stories where not all is what it appears to be at first glance, whether that be a book or television show or movie, that's what hooks me, that's what interests me. Tell me about writing "Godzilla." That was just a heavy riff that was created in a Dallas hotel room. What came to my mind was Godzilla because 'what's heavier than Godzilla?" (laughs) Nothing. The song was pretty much right in the pocket to what people wanted to hear. We're all huge fans of the original movie where they dubbed Raymond Burr into the movie for the American release. They put him in a narrative role. If you look closely in the scenes where he's interacting with the Japanese actors they never face the camera because there were obviously other people standing in. His scenes were probably shot in Hollywood and edited in. With the lyrics what I did was just reprise the moral lesson that the movie did. Basically that Godzilla was basically man's fault. In the movie it was messing around with nuclear energy that was blamed for Godzilla's unleashing. Ironically if it was nuclear testing in the Pacific that awakened Godzilla it was Tokyo that suffered. I thought that was weird. "Burning For You" is perhaps the most commercial of all BOC's song, sporting an infectious melody and hook that wouldn't go away. That was almost conscious pop craft. After "The Reaper" was a hit the band was under commercial pressure to have more. "Burning For You" was actually written for my solo record, which came out in '82. The band convinced me to let them release it because they obviously heard the potential of it. So I agreed to do that, so that's what happened. Were you reluctant to give the song up? At the time I figured that was probably the best thing for the band so that's what I did. I often wonder what my life would have been like had I not done that. Just a passing thought. That was just the way that it went down. The lyric on that was written by Richard Meltzer. I think that's probably his most sentimental lyric. He's not a very sentimental person (laughs) so for him to write an actual thoughtful and sentimental lyric is kind of funny. Although it's still classic Meltzer with the lines like, 'Time to play B-sides.' Which you're not gonna hear in your average tune. The whole B-side thing is really neat, of course it'' gone now. There'' no such thing as a B-side now. 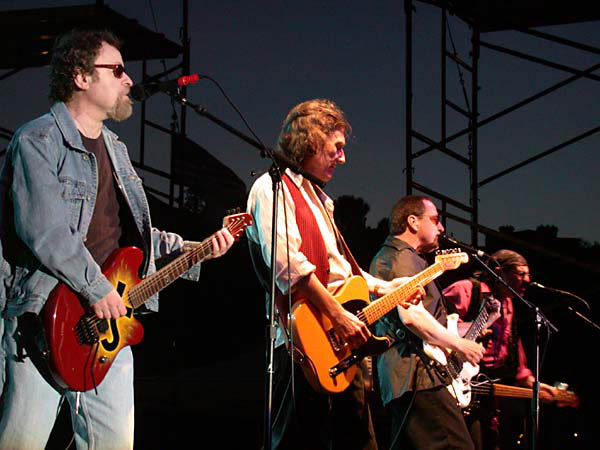 What do you feel the biggest misconception people have had about Blue �yster Cult? Just trashing us because of the aspects of our image, that we were like some stupid or dangerous heavy metal band, (laughs) when actually we were really thoughtful and entertaining. Can you whittle down the list and pick what you believe to be the most quintessential BOC albums? The quintessential? I don't know, a lot of them are different. The ones that I like that aren't as well known as some of the other ones is Cultosaurus Erectus. That was the first record that we did with Martin Birch, it was a really good record that didn't really reach the audience that it should have. Secret Treaties is really like the culmination of the first three records which sort of link conceptually in my mind. Secret Treaties is Sandy Pearlman's concept of what the band was and us really feeling our way creating what it was. By the time we got to Agents Of Fortune, which was the next studio record after the live record, I think we shifted gears and went to another place. And that was the point where we first had commercial success. To the credit of the way the music business was at that time, we made three records for a major label before we had a hit. That doesn't happen today. You don't get the time. You won't get three records out of a record company. The thought of the music business today is total disposability. Everything has a shorter half-life these days. MTV is part of it, the quick cut thing, these people have no attention span. They talk a lot about kids with attention deficit disorder. I don't think that's what's going on, I just think that the rapidity of entertainment, all entertainment that is aimed at kids, video games, even commercials for food stuffs like snack and breakfast cereals is all just totally frenetic. I think it's creating generations of very short attention span consumers. Lastly, tell us about sci-fi writer, John Shirley (The Crow) helping out as a lyricist on the new CD. John's very prolific and always very much rooted in his novel writing. He's very entertaining in his way. He writes tons of lyrics and sends them to Eric (Bloom) and I. Eric and I tend to write different styles of John's lyrics. I look for the one's that suit my sensibility and Eric goes for the ones that suit his. There are songs of John's that I'm working on that the band hasn't released yet that are different from the ones that you are hearing. I've written lyrics but I'm terribly self-critical and take a long time. I'm very shy about exposing my words. I would rather use someone else's words but they have to resonate with me for me to do it. I'm very happy to work with John. John was actually introduced to us by Sandy (Pearlman) William Gibson actually credits John with the whole cyber space thing. He actually created it and William Gibson kind of caged it from him. Copyright �2008 PopEntertainment.com. All rights reserved. 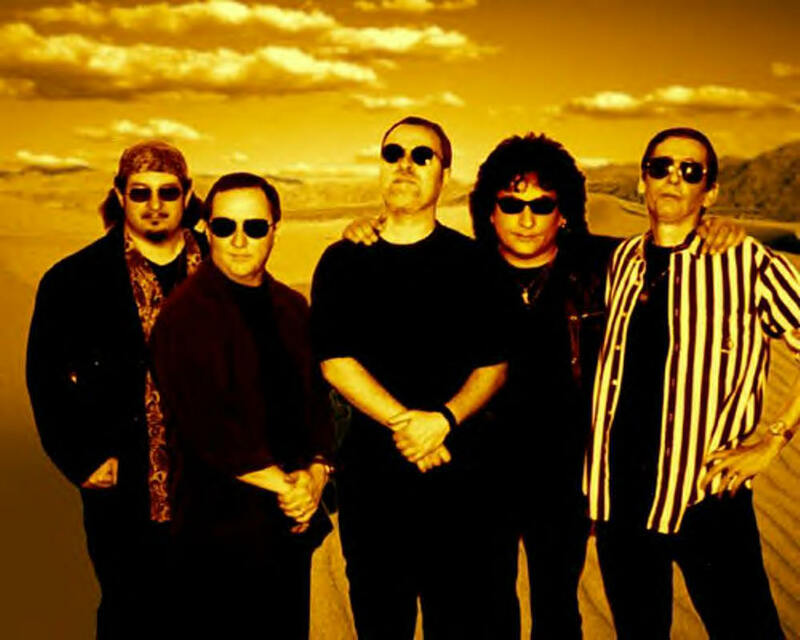 #1 � 2003 Courtesy of Blue �yster Cult. All rights reserved. #2 � 2003 Courtesy of Sony Records. All rights reserved. #3 � 2002 Melne. Courtesy of Blue �yster Cult. All rights reserved.